Also serving communities of Viera. There are 40 Assisted Living Facilities in the Rockledge area, with 5 in Rockledge and 35 nearby. The average cost of assisted living in Rockledge is $2,983 per month. This is lower than the national median of $3,346. Cheaper nearby regions include Cocoa with an average starting cost of $2,350. To help you with your search, browse the 185 reviews below for assisted living facilities in Rockledge. On average, consumers rate assisted living in Rockledge 4.0 out of 5 stars. Better rated regions include Cocoa with an average rating of 4.8 out of 5 stars. Caring.com has helped thousands of families find high-quality senior care. To speak with one of our Family Advisors about assisted living options and costs in Rockledge, call (855) 863-8283. Pineapple Farm Adult Living Inc.
Community currently offers a 10% discount on all apartments for veterans. Situated on the eastern coast of Florida, Rockledge is the oldest city in Brevard County. Rockledge is located 54 miles east of Orlando and 74 miles south of Daytona Beach and has an approximate senior population of 21 percent. Assisted living facilities (ALFs) in Rockledge are defined by the Department of Elder Affairs as centers that provide housing, meals and personal care to older adults. Seniors in this community have 40 ALFs in the Rockledge area to choose from, with five directly within the city limits and 35 nearby. ALFs in Florida fall into four distinct categories and are licensed by the Florida Agency for Health Care Administration. Because Rockledge is situated along the coast in close proximity to the Gulf Stream, the city experiences a humid climate with two major seasons: a hot, rainy summer from June to September and a dry season with moderate temperatures from October to May. Seniors who dislike the rain should consider looking elsewhere for assisted living as Rockledge gets an average of 12 more inches of rain annually than the national average. Rockledge has an array of community resources for seniors, including the Martin Andersen Senior Center, an organization that provides opportunities for seniors to get together to play board games, learn new skills and exercise. The Rockledge area is home to world-class medical facilities, including the Rockledge Regional Medical Center, in the event of medical emergencies or illness. The Space Coast Area Transit system services the Rockledge area. Seniors over the age of 60 qualify for reduced fare on bus and paratransit lines, but should also make note that this public transportation service does not operate on Sundays. Seniors who are looking for assisted living within a relatively safe city in the state of Florida might do well to consider Rockledge. The crime rate in Rockledge is 22 percent lower than the country's average crime rate. Though the overall cost of living in Rockledge is higher than the national mean cost of living, seniors will find health care costs less expensive than the U.S. average and grocery costs approximately the same. Assisted Living costs in Rockledge start around $2,983 per month on average, while the nationwide average cost of assisted living is $4,000 per month, according to the latest figures from Genworth’s Cost of Care Survey. It’s important to note that assisted living rates in Rockledge and the surrounding suburbs can vary widely based on factors such as location, the level of care needed, apartment size and the types of amenities offered at each community. The state of Florida provides financial assistance for specific services in ALFs under a statewide 1915(b)(c) MLTC program for eligible waiver participants who are offered a private room, private apartment or unit that is shared only by consent. 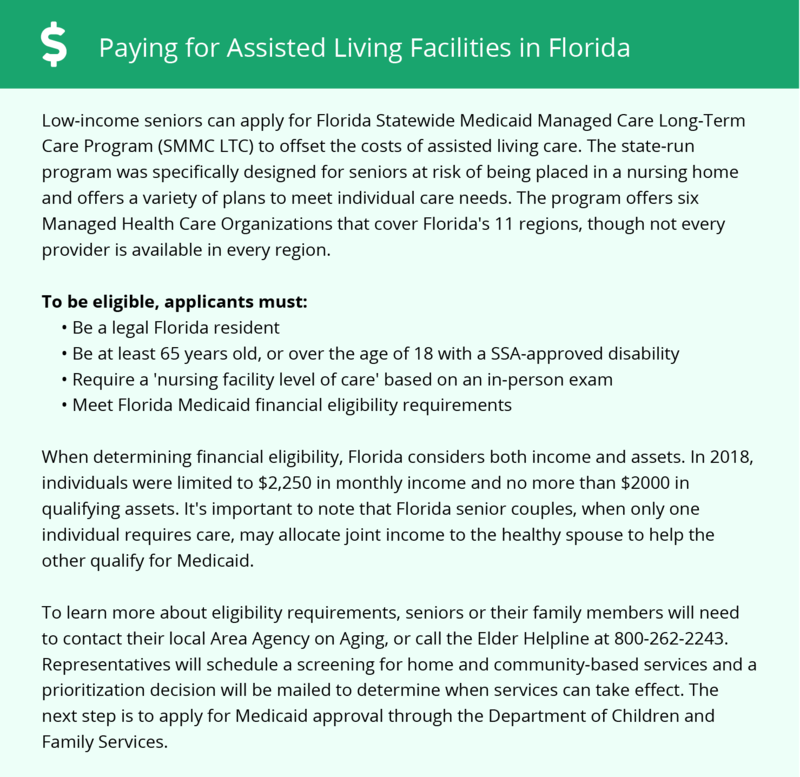 Seniors can also receive financial aid from the Florida Statewide Medicaid Managed Care Long-Term Care Program (SMMC LTC). To see a list of free assisted living resources in Rockledge, please visit our Assisted Living in Florida page. Rockledge-area assisted living communities must adhere to the comprehensive set of state laws and regulations that all assisted living communities in Florida are required to follow. Visit our Assisted Living in Florida page for more information about these laws.